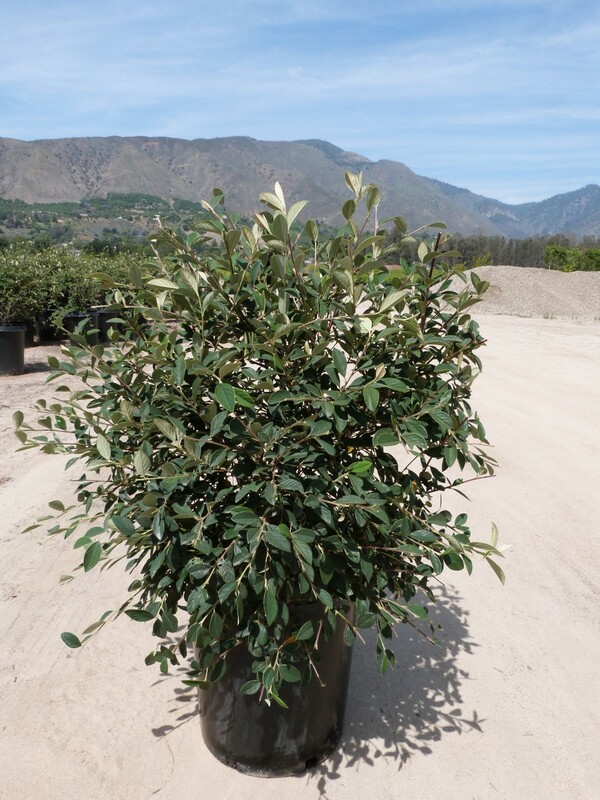 Cotoneaster parneyi is a graceful arching shrub perfect for natural, low-maintenance landscapes. Plants grow quickly to an average of 8-feet tall with an informal, organic form. The small oval leaves are dark green with pale green undersides. In fall the foliage turns a deep purple color, which offers a striking contrast to the bright red berries. Before the berries emerge in fall, plants produce loads of small white blooms in spring. Butterflies and bees are highly attracted to the small flowers. This is an excellent plant if you want to add year-round interested to a landscape. It can be used on slopes, as an accent plant or even an informal hedge. Do not shear or attempt to pruning into a formal shape; plants should only be tip-pruned lightly so as not to destroy the appealing natural form. Plants perform best in a full sun location and can tolerate a variety of soil. Plants have low to moderate water needs once established and prefer good drainage.